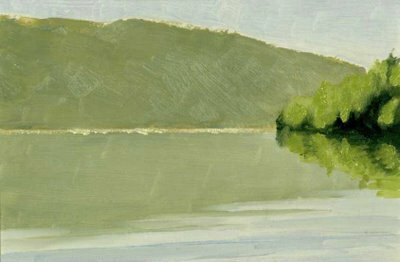 Here's the other painting mentioned in the previous post, a study of Sullivan Lake in Washington. I have been painting the past week and am feeling good about it, but have nothing to post yet. I will soon though. Much of my free time has been spent in the basement where I'm constructing a shop area for woodworking and picture framing, and a studio area for painting large landscapes. In the meantime I've been painting in the dining room using my paintbox-easel or a sketching easel. I feel like going for a morning swim. Very inviting. Happy Holidays.